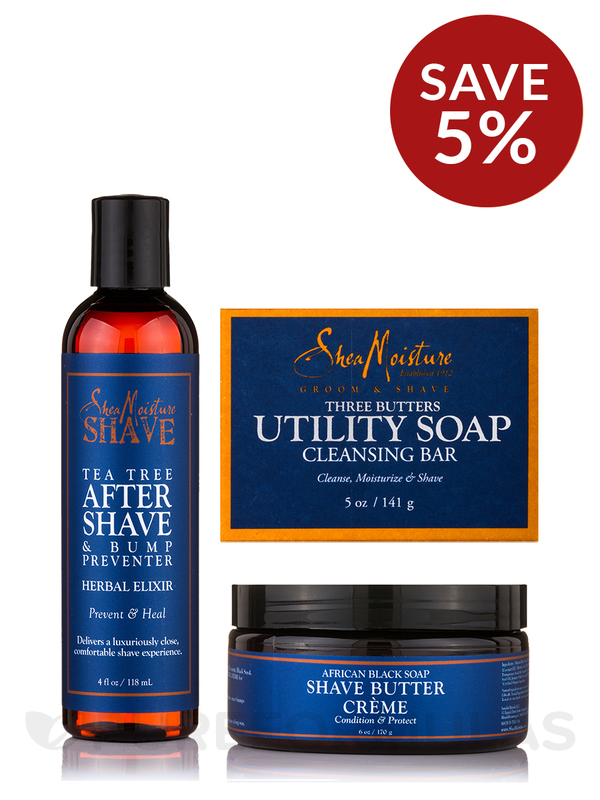 A rich-lather shaving soap and all-in-one cleanser for face‚ body and hair. Formulated with ultra-moisturizing‚ certified organic Shea‚ Cocoa‚ Mango and Avocado Butters. What it does: Removes sweat and dirt‚ cleansing hair and skin without stripping away natural oils. Delivers a close shave. African Black Soap and organic Shea Butter blend with healing oils of Coconut‚ Black Seed‚ Juniper and Willow Bark Extract to create a luxurious Shave Butter Creme for all skin types. What it does: Delivers the closest shave possible with no razor drag heals ingrown hairs‚ razor bumps and skin discoloration. Shea Moisture alcohol-free after shave for all skin types is formulated with naturally antiseptic Tea Tree Oil‚ organic Shea Butter and Willow Bark Extract. 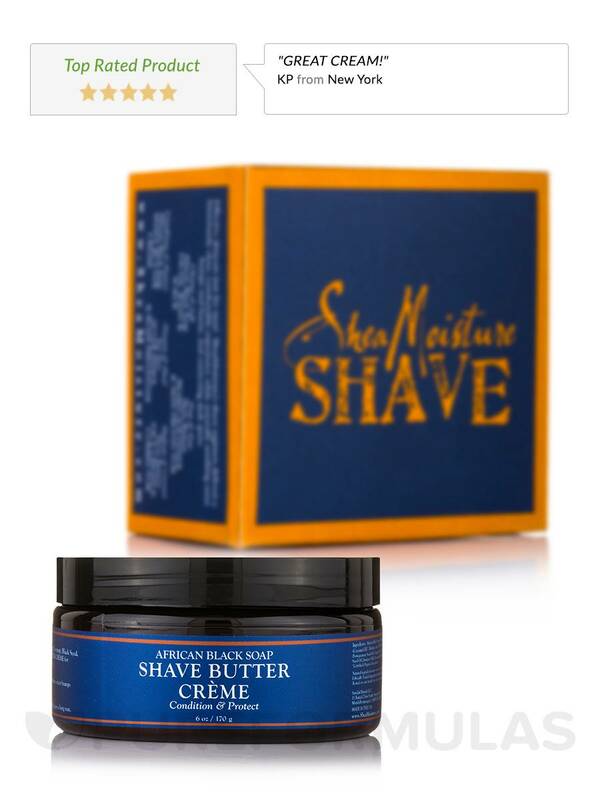 This fast absorbing treatment restores natural moisture allowing you to shave everyday with seriously smooth results. 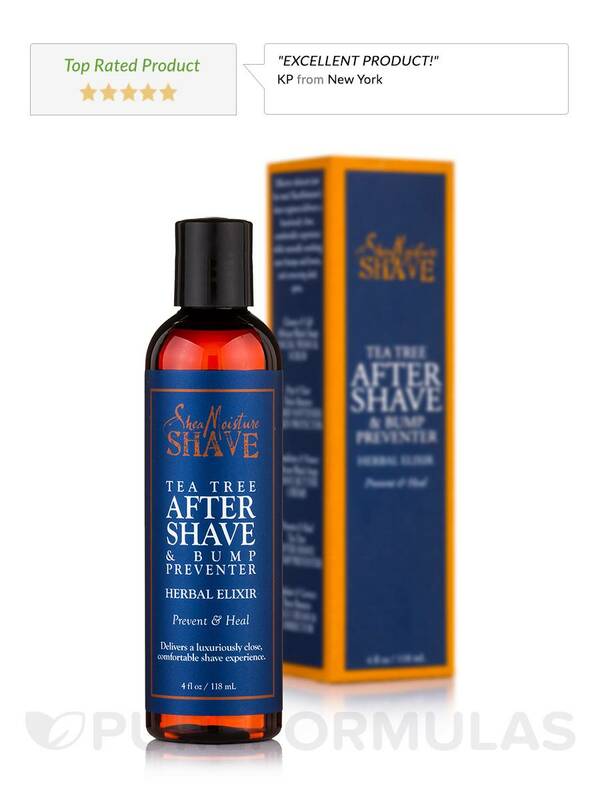 Soothes and helps promote the healing of minor nicks and cuts while calming razor burn. 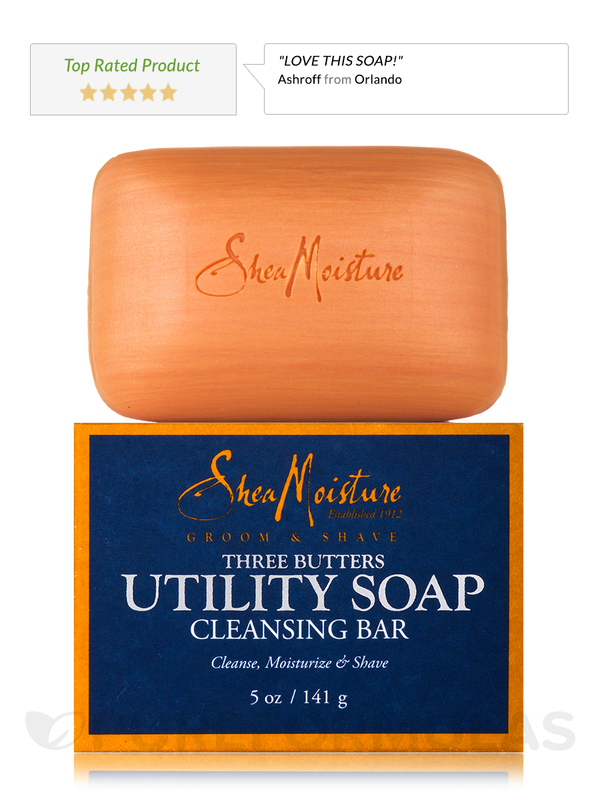 - Shea Butter: Deeply moisturizes and repairs skin with vitamins and essential fatty acids. - Tea Tree Oil: Promotes healing with naturally anti-septic properties. - Aloe: Moisturizes and calms dry‚ sensitive skin. Theobroma Cacao (Cocoa) Seed Butter*‚ Butyrospermum Parkii (Shea Butter)*‚ Mango Butter‚ Coconut Oil* and-or Palm Oil Soap Base‚ Apricot Oil‚ Nigella Sativa (Black Seed)‚ Honey‚ Vegetyable Glycerin‚ Tocopherol (Vitamin E) Mineral Pigment or Vegetable Color‚ Essential Oil Blend. Certified Organic Ingredients / Cruelty-Free. African Black Soap‚ Deionized Water‚ Shea Butter‚ Cascarilla Bark Extract‚ Vegetable Squalene‚ Jojoba Oil‚ Sodium Lauroyl Lactylate (Coconut Oil)‚ Myristic Acid (Palm Oil)‚ Coconut Oil‚ Willow Bark Extract‚ Vitamin A‚ Coconut Fatty Acids‚ Palm Oil Fatty Acids‚ Vitamin E‚ Pomegranate Seed Oil‚ Vegetable Glycerine‚ Glycerine‚ Benzyl PCA‚ Alpha-Bisabolol (Chamomile Extract)‚ Allantoin (Comfrey Root Extract)‚ Black Seed Oil‚ Juniper Oild‚ Essential Oil Blend. Shea Oil‚ Witch Hazel‚ Aloe Vera‚ Willowbark Extract‚ Alpha Bisabolol (Chamomile Extract)‚ Panthenol (Vitamin B)‚ Peppermint Extract‚ Tea Tree Oil‚ Vitamin A‚ Vitamin E‚ Shea Butter‚ Birchwood Sap‚ Jojoba Oil‚ Olive Oil‚ Grapefruit Extract‚ Essential Oil Blend. For cleansing‚ lather in hands or on a washcloth and wash entire body and hair. For shaving‚ wet face with warm water and apply soap lather with fingertips or shave brush. Shave and Rinse. Apply directly to beard or scalp using shave brush or fingertips. A little goes a long way. Pour a dime-size amount onto palm; smooth evenly over just-shaved skin. Use daily. Natural ingredients which vary in color and consistency. If irritation occurs‚ discontinue use.